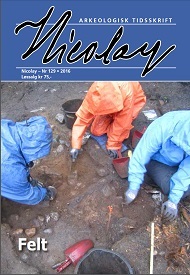 Since 1967 the archaeology students at the University of Oslo have published their own archaeological journal, Nicolay arkeologisk tidsskrift. It began as a publication where students and others who were interested in the field could get a short orientation about the most important and exciting excavation of that year. Today the journal publishes articles by researches within the fields of archaeology, conservation and history, and any related fields, and articles written by students of archaeology on both undergraduate and graduate level. Graduate students are especially encouraged to write an article based on their MA-thesis for the journal. This platform provides a very good opportunity for students to get experience with publishing, and to be noticed and recognized by future archaeological colleagues. And it is hoped that this journal is beneficial for both students and researches alike, as well as being a good source for information for the general public. Since 2016 the journal publishes two editions each year, in the autumn and in the spring. Articles can be submitted in any Scandinavian language, or in English.